If you are looking for an elegant and professional looking smooth scrolling WordPress single page theme for building your business portfolio website. Where you can showcase not only your creative works, but also able to display each and every single business information's in a modern way. Then we have the perfect theme for you. Today we have a look at a free responsive one page WordPress theme SinglePro which you can build your desired website with no cost. This theme is completely free to use, licensed under the GPL license. Today we have a look at a free responsive one page WordPress theme SinglePro which you can build your desired website with no cost. This theme is completely free to use, licensed under the GPL license. This theme is completely free to use, licensed under GPL license. 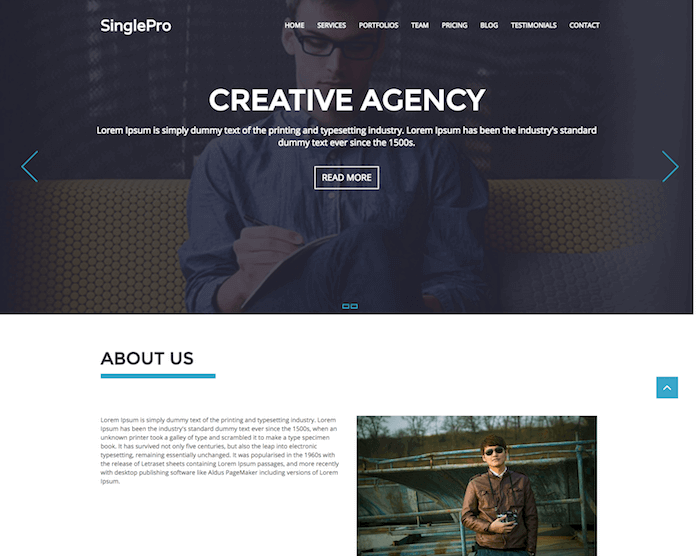 SinglePro is free premium quality single page WordPress theme created by WpFreeware. It has all of those modern features like portfolio or business websites need. SinglePro features an ultra responsive layout & retina ready display. Means your website will be optimized for any kind of devices including iPhones, iPads, Androids, Windows, desktops, laptops, and tablets. It is built with the bootstrap framework. SinglePro theme is perfectly suitable for those who want to build a one-page scrolling website. To showcase their portfolios, about their business, team members with bio, skills, services, pricing tables, testimonials, clients logo, google map with contact form 7, subscription, social profiles etc in a modern and trendy way. The theme is designed with modern technologies like smooth scrolling, css3 animations, css3 hover effects etc perfect for those who haven't any budget for purchasing a premium theme. SinglePro is suitable for business, corporate, portfolio, individuals, freelancers, graphic designers, creative agencies, startup & lots more. SinglePro supports unlimited color schemes. Perfect for everyone who wants to build their website uniquely. You can define any color you like from admin panel through the color picker. SinglePro has 5 different custom post types for sliders, pricing tables, services, team members, portfolios etc. You can add your own contents easily by using those features. You find multiple carousel sliders which through you can display your valuable information's such as about us gallery. You can display pictures related to your business, your awesome team members with their name/designation/short bio/social profiles etc, clients testimonials, your clients logo's etc. SinglePro comes with filterable portfolio gallery with details in a popup window. So you can showcase and present your creative works in one page. SinglePro is built with the most popular and powerful theme options framework Redux. You will be able to change each & every single element from the theme options panel. You can enable/disable any section you want, upload logo/favicon, enable/disable preloader, footer texts, social link, google map and much more. If you run into any problem or you have basic knowledge about WordPress. You can you watch all the videos available on how to install SinglePro, How to setup the Front Page template, How to Change the Font-awesome icons and more. Very helpful and time-saving. More videos are added as the users request more help.